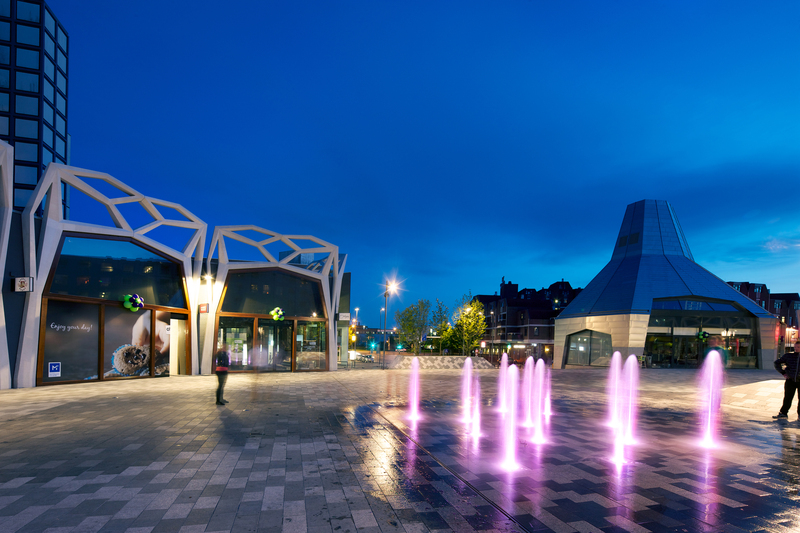 The city of Nieuwegein built a shopping center in the seventies that has slowly become aesthetically and functionally. 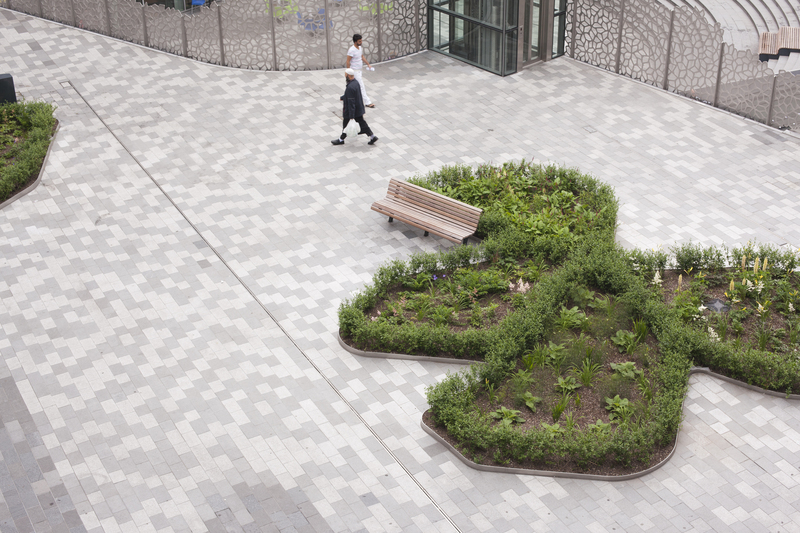 This led to B+B developing the concept of creating a new `Blooming´ public space surrounding the area. The vision consisted of stressing this aspect of ‘bloom’. The pavement has been given a pattern of flowers and branches that unite the space, and, on top of a parking deck, raised planting compartments are placed to revive the area by giving color throughout the seasons. The center is divided into three squares and one boulevard, which each have their individual characteristics and material due to height differences and variations in planting combining to illustrate the main image of a ‘Blooming City’. 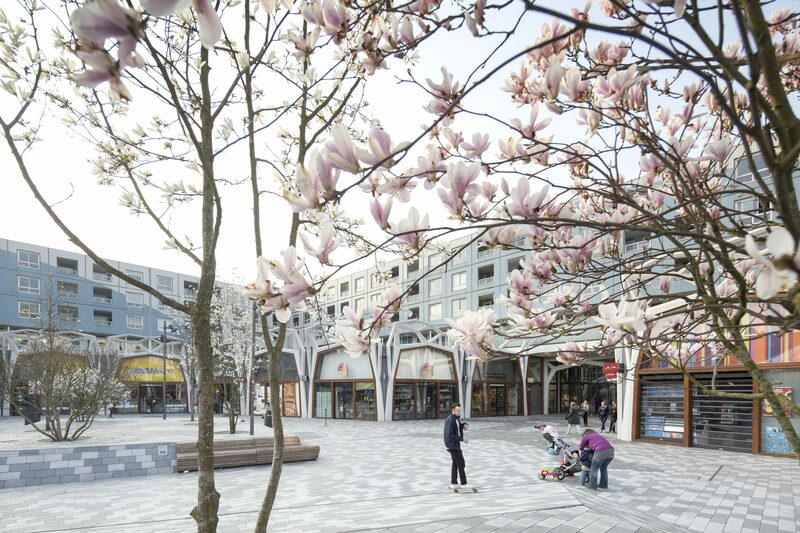 Like many other New Towns, Nieuwegein was faced with the challenge of transforming the old shopping center into a bustling city center. 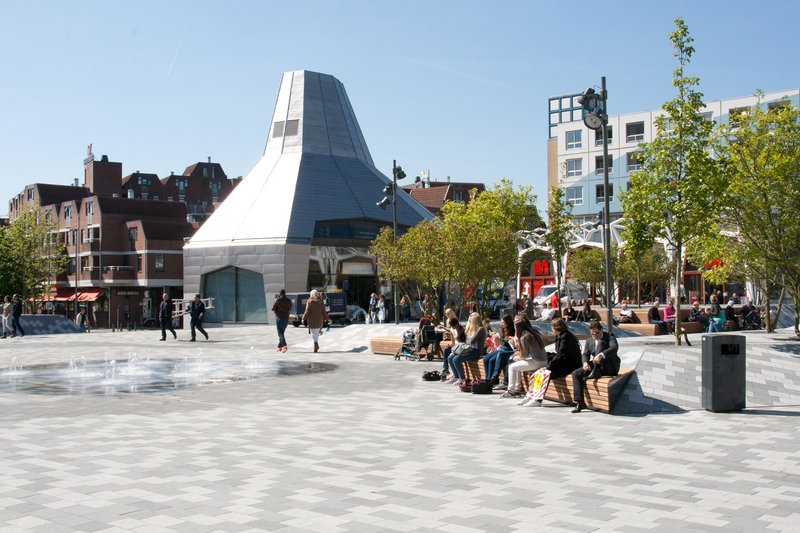 Bureau B+B strengthened the municipality’s development concept, in cooperation with UNStudio and Michael van Gessel. The original seventies lay-out was drastically altered. The updated shopping center is composed of a greater open atmosphere and an increase in multi-functional space. 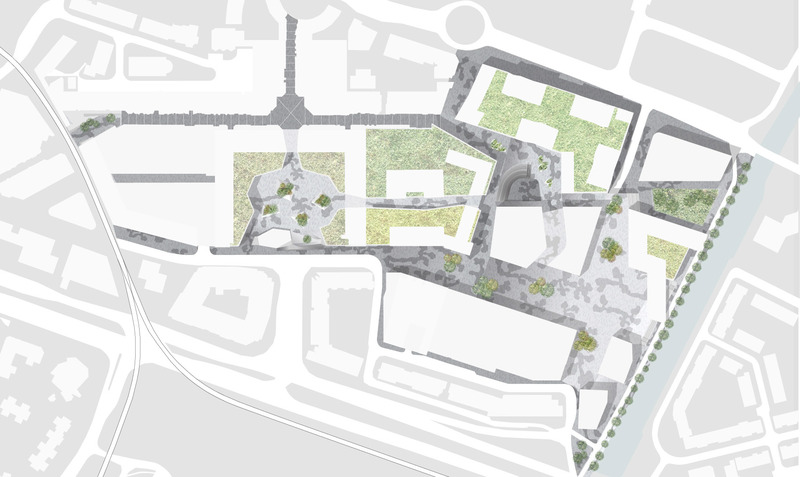 The space for businesses has doubled, and the addition of apartments, offices, a town hall, theatre, cinema, music center and library create a diversity of activities that contribute to the space. 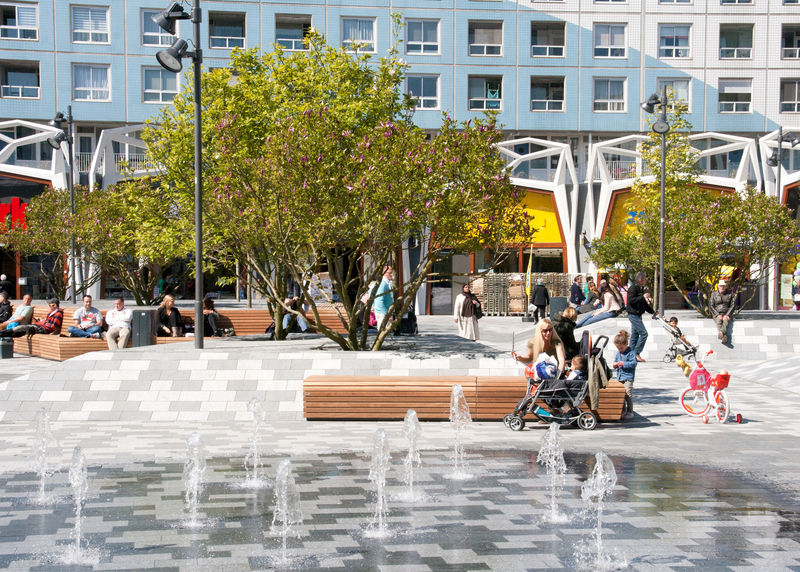 A ‘Blooming City’ was the vision for the redevelopment of the city center. This can be can be interpreted figuratively in the sense of a booming shopping center, but also literally as a place with many flowers. The position of the new city center on a raised parking deck, made it necessary to construct raised planting compartments. 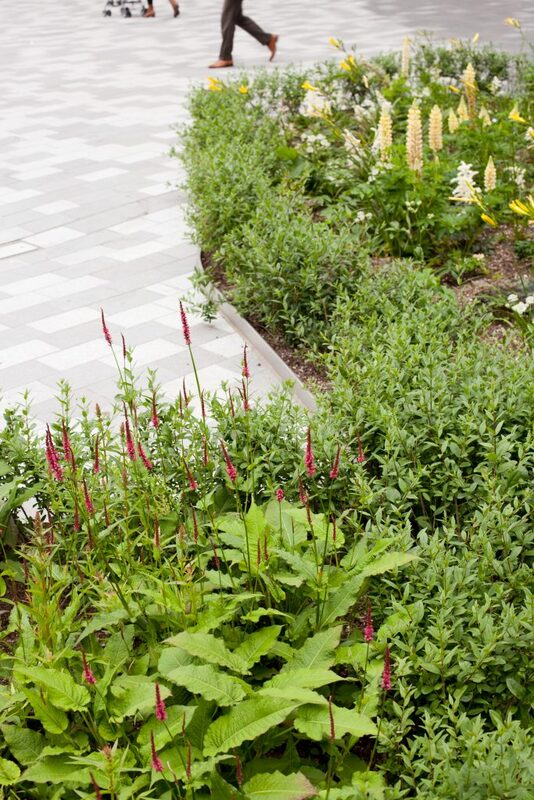 A combination of plants was chosen that continuously give color throughout the seasons. 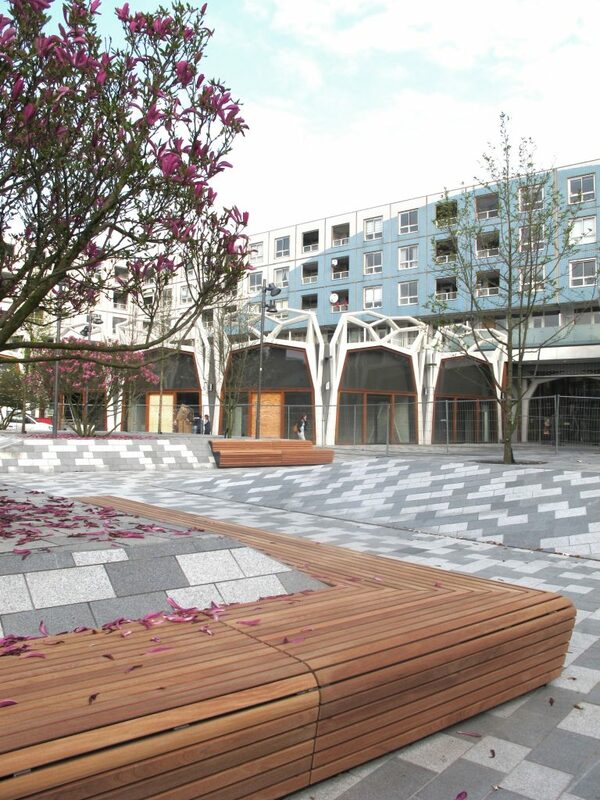 The planting compartments and the street furniture are integrated into the flowing surface, which is composed of a natural stone pavement with a pattern of abstract flowers and branches. The city center is divided into a number of different squares: the Shopping Plaza, the City Square, the Market Square and the City Boulevard. 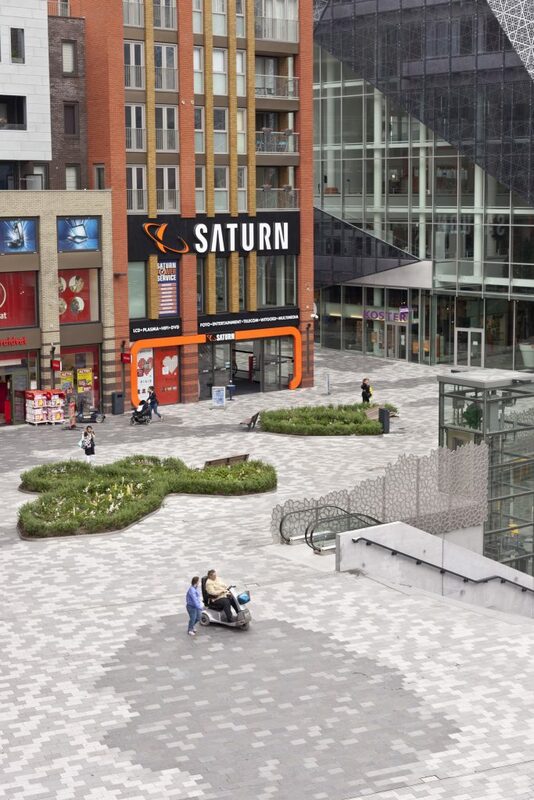 Height differences and variation in planting give each square its own character.The shopping plaza has an upper and a lower level that are connected by wide theatrical stair, an elevator and an escalator. 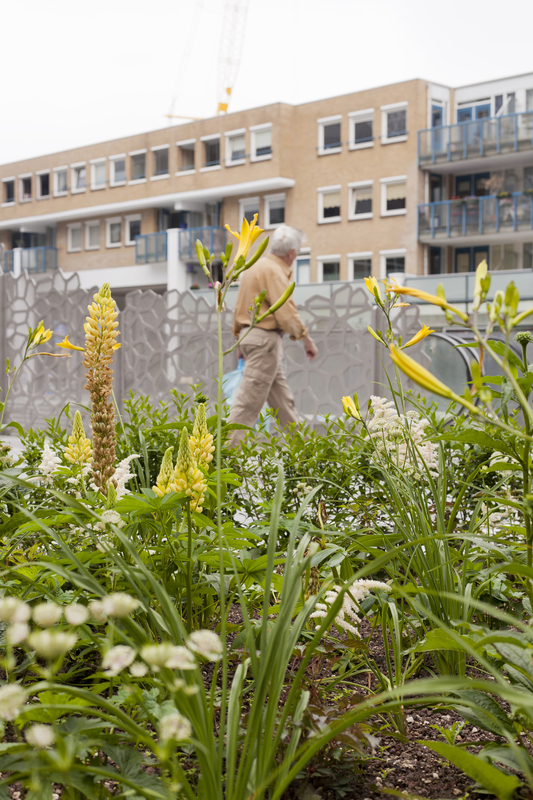 Planting compartments with perennials and bulbs give the upper level a green character while a designed flower-patterned fence has been placed on the lower level. 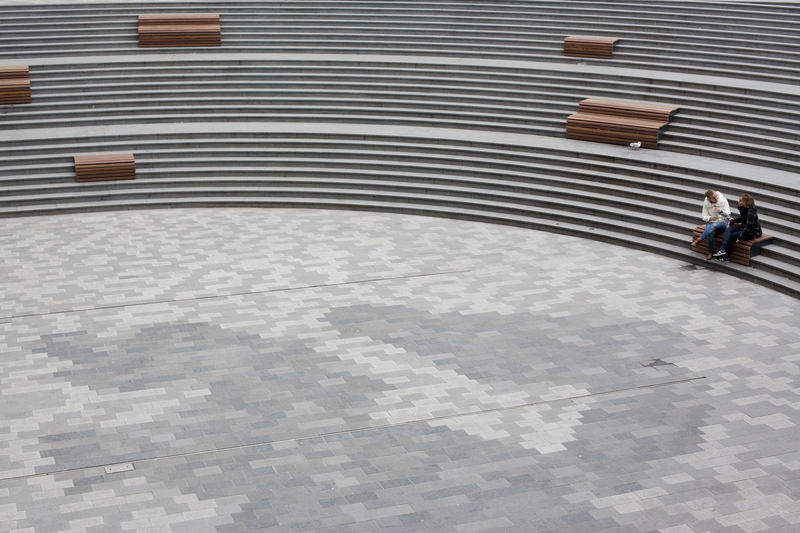 The City Square is a representative space, where the entrances to the City Hall and the theater are located. It offers room for events and for a market every Saturday. The flowering trees in the various islands provide color throughout the year. 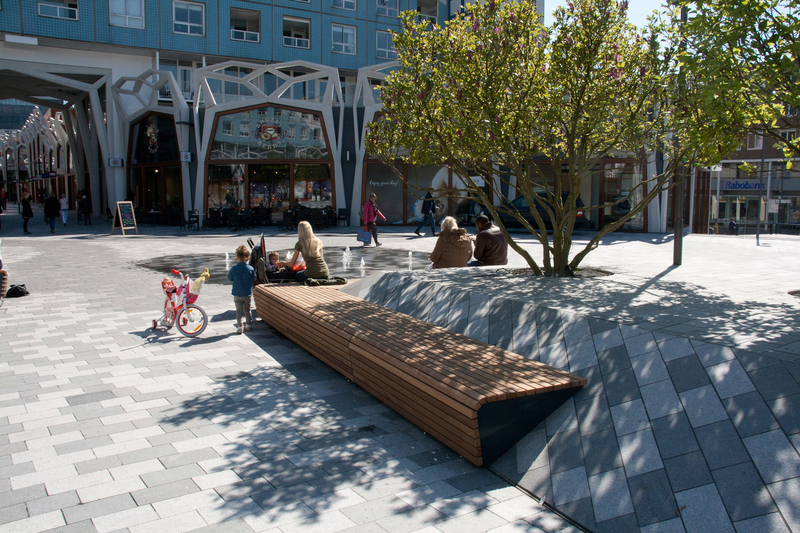 These tree islands offer visitors a place to sit and enjoy the view of the City Boulevard. The Market square is a space with restaurants, cafés, and shops. Groups of low and flowering magnolias make an intimate atmosphere. The elevated ground level surrounding the trees provides them with enough room for their roots to grow. The rim around the tree clusters is also an inviting bench. Pedestrians pass through a winding, rising street level to reach the plaza. The City Boulevard contains a bicycle and a footpath alongside the canal ‘de Doorslag’. The square and the quay with seating create a pleasant place to relax by the side of the water. Due to new moorings, pleasure boats can now visit the center. The city center is divided into a number of different squares: the Shopping Plaza, the City Square, the Market Square and the City Boulevard. A combination of plants was chosen that gives color throughout the seasons. The position of the new city centre on a raised parking deck, made it necessary to construct raised planting compartments. 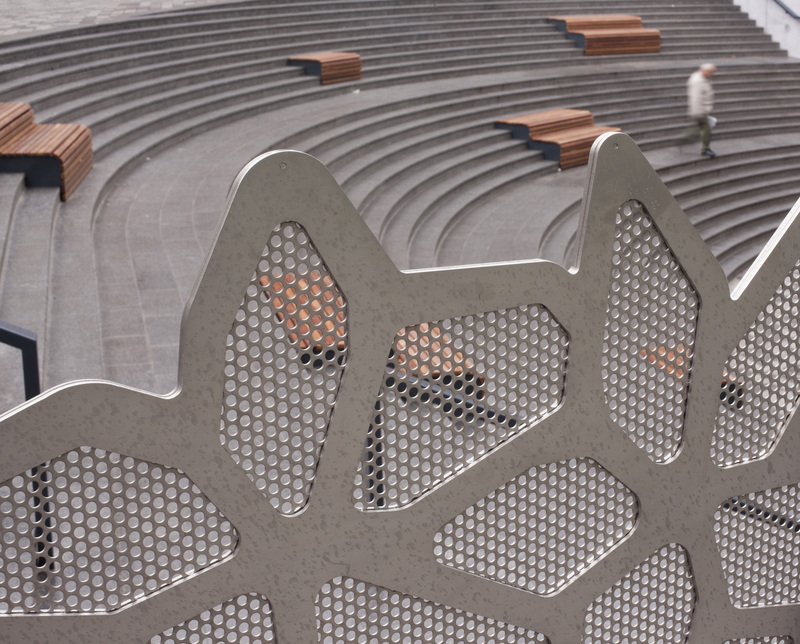 A tailor made flower-patterned fence has been placed on the lower level. The shopping plaza has an upper and a lower level connected by wide theatrical stairs. The natural stone pavement has a pattern of abstract flowers and branches.